As a somewhat jaded and world-weary incarcerated writer, rarely do I read something that makes me really mad. I report on every variety of correctional incompetence and failure out there—and I have plenty to write about. When it comes to harebrained and wrong-headed ideas put forward by policy makers, I thought that I had seen it all. 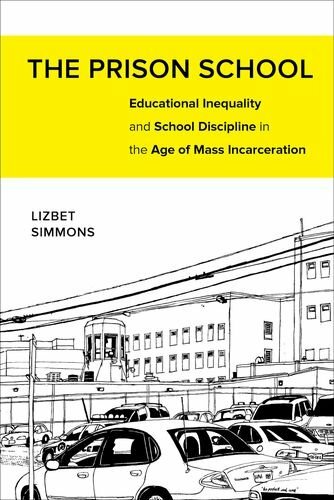 But then I read Lizbet Simmons' enraging new book, The Prison School. Simmons, a sociologist living in Los Angeles, spent years researching and preparing The Prison School for publication. The book is meticulously documented and grounded in scholarship, but manages to be very readable. The topic of the book is what stands out, however. And it's a doozy. The Prison School is about a New Orleans, Louisiana, sheriff who decided that it was a good idea to open up a school for disruptive black children INSIDE A PRISON! The year was 2002. The nationwide encroachment of the criminal justice system and its zero-tolerance punitive practices into the public school system was in full swing. The presence of law enforcement on school grounds was skyrocketing. As Simmons notes, in the 1970s, there were fewer than 100 “School Resource Officers” (police) in public schools nationwide; by 2007, there were nearly 20,000. Sheriff Charles Foti of the New Orleans Parish was a believer in the power of prison and incarceration. On his 30-year watch, the population of New Orleans Parish Prison rose nearly 1,000 percent—from 800 prisoners in 1974 to 8,500 in 2004. He has been described as "God's most innovative penologist," and in his own words, was "out to save the children." So perhaps it is not entirely surprising that he thought it would be a good idea to open a school for disruptive youth, all of whom just happened to be black, on the grounds of his enormous jail complex, the New Orleans Parish Prison. Simmons examines this short-lived phenomena—the Prison School closed after just a few short months—from all angles. She begins with a thorough analysis of what others have termed the "school-to-prison pipeline"—or in her words "the complex dynamics that have pushed students from school and pushed them toward the criminal justice system." Simmons determines that the "school-to-prison pipeline" analogy isn't quite correct when it comes to describing the "black prison diaspora," however. The Prison School is a perfect example of why the concept of a school-to-prison pipeline is oversimplified. The idea of a pipeline presupposes a journey from one thing (i.e. school) to another (i.e. prison). But Simmons points out that today schools are becoming prisons. In the case of the Prison School, the school quite literally did become a prison. Indeed, if the analogy exists at all, it seems to be running backward, with all of the machinery of the prison flowing into the school. The data establishing carceral creep into the school system is clear and it is undeniably aimed at black youth. "[M]inority students are . . . far more punitively managed than white students," reports Simmons. Moreover, "[s]chools with large African American student populations have the highest student-to-police ratios, the greatest implementation of high-security technologies, and the harshest penalties under zero-tolerance policies." From higher rates of suspension and expulsion to increasing arrest rates on school grounds, it is clear that the carceral state is no longer satisfied with waiting for the young black man. It is reaching into the school and wrapping its tentacles around the vulnerable black child. Perhaps the most disturbing aspect of what Simmons describes as "the punitive shift in education" is the development of the "at-risk youth industry." Despite evidence that public schools continue to be the safest places in the world for children, public and political perceptions have shifted, and widely held beliefs that schools are dangerous have taken hold. "As school administrators nationwide were groping for a solution to a security problem they did not have, security manufacturers were capitalizing on their burgeoning interest," notes Simmons. From metal detectors to bulletproof wipeboards, the school security industry stepped up to solve nonexistent problems while feeding at the trough of federal Homeland Security largesse. But the school security industry is just the tip of the "at-risk youth industry" iceberg. Indeed, leading investment firms have looked covetously upon the billions of dollars potentially available in the "growth industry" of at-risk youth services. The stomach-turning approach of greedy, morally bankrupt industry players to the very real and tragic problems of many children is nicely summed up by Florence Simcoe, who directed "services" for mentally ill children at Century Health Care. Simcoe explained that the mentally ill children under her company's care were simply "bodies that we got $300 a day for." It is with this background and within this context that Simmons sets the story for the Prison School, a "school" that was harder to gain access to than San Quentin. Two former students, Spider and Jamal, provide many of the details of the school. The school was located on the grounds of the sprawling New Orleans Parish Prison complex. There were bars on the windows and security cameras everywhere. According to the students, this included the bathroom, which was nothing more than a series of stainless steel jail toilets with no partitions or privacy. The "security" staff at the Prison School were armed sheriff's deputies who routinely used their handcuffs, especially when escorting disruptive students to the discipline area, which was described as a cage (Sheriff Foti denied that the Deputies were armed). The "teachers" were unlicensed and utterly incompetent. The "school day" lasted from 8:15 a.m. to 7:30 p.m., with almost no education taking place. None of the "classes" counted toward curriculum or degree requirements. All of the students were black boys, though officials claimed that they added one white boy after the school opened. The Prison School is a disturbing and important book. The school itself was short-lived. But what it represents is a serious problem in this country. Simmons posits that "correctional risk diminishes as education level rises." If we assume that this data-supported and commonsense conclusion is true, should we not question the rise of policies and industries that disrupt education? And can we continue to turn away from the clearly racist impact of the correctional approach to education? Simmons sums up the difficulty of stopping and reversing carceral creep into public schools thus: "The correctional approach is a path of least resistance for public schools. It enables the boon of capital accumulation by benefiting school funding, supporting the punishment industry, and sponsoring neoliberalism, while offering a containment strategy for socioeconomically and academically marginalized populations." It's a tall order. But as Simmons says, "The promise of democracy resides in the potential for public schools to meet this challenge." The public school system is no place for rigid, correctional-style practices, and it remains to be seen whether our democracy will meet the challenges of stopping the flow of the school into the prison.